A I don't think I look fabulous but I make the effort to look as best as I can. I exercise because I like to be fit. 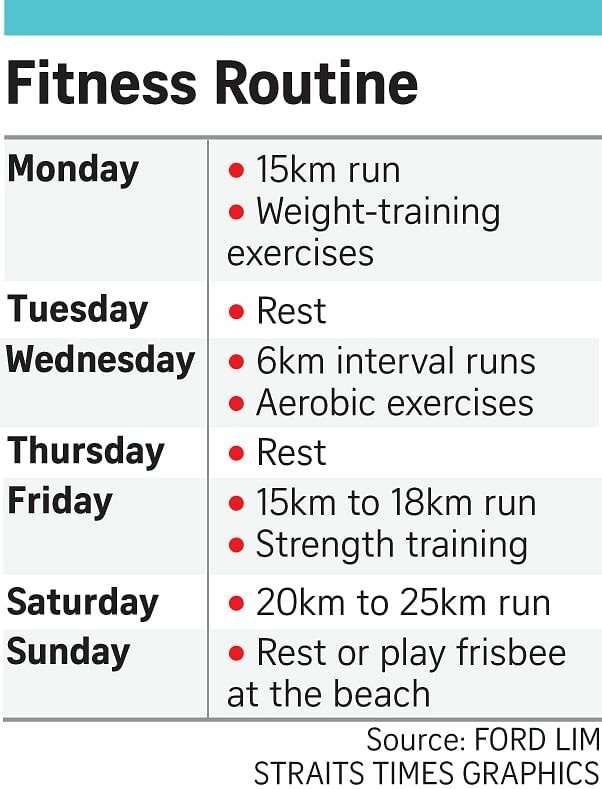 A I like having a strict fitness routine. I used to take part in longer endurance events, but none of that matters to me now. Now, I'd rather guide someone who is keen to do that and that alone requires me to stay in shape. I plan my own training routines and, thus far, it's been great. Q Why did you stop competing in races regularly? A Well, I still race but my priorities have changed. People ask me why I have stopped taking part in ultra events but I don't see why I should keep up the same pace. I've been there and done that. I would much rather help a friend during an event or stay in touch with the ultra-running or fitness community. I now compete with myself, with what's in my head. I used to train for the sake of my ego, but now, I don't really care if I don't hit the numbers in the gym. Q What keeps you going then? A I'm an average person with average fitness; it's really about having fun. Working out in an intensive environment helps me stay sane. I believe in celebrating fitness and inspiring others. And I think you should look your part if you want to help others. People can tell a lot about you by looking at how you treat yourself. A I started working out seriously - or losing weight, actually - only when I was 17. That was in 2004, when I decided to go for a run. Before that, I was in the Trim And Fit Club for overweight pupils. Q Did you use to eat a lot? A Oh, I loved to eat. You know how some children have super-doting grandparents who constantly satiate their food cravings? I was one of those kids. I should add that I was responsible for my weight gain as I did not control my caloric intake. I did try to exercise in secondary school but I always kept a stash of sandwiches under my desk. Q What did you do to lose weight? A I got sick of being fat. I got tired of the insults and not being able to look at my feet without my double chin suffocating me. Frankly, it was a process of trial and error. I figured out that in order to lose weight, my caloric intake had to be less than what my body needed. So I removed the processed carbs and meat from my diet and ate just fruit and vegetables. It worked and I lost quite a bit of weight. Mr Lim is the founder of running group, Ultra Running Singapore, and he has taken part in various races. Looking at him, you would never have guessed that he was once overweight and had an eating disorder. He overcame this problem in 2012 and has stayed fighting fit since. The bachelor, who is the elder of two children, is a pre-school principal. He maintains a regular fitness regime for the love of it. He says he enjoys challenging himself physically. A Eating whatever I wanted and throwing up afterwards. I did that from 2007 to around 2012. It broke my heart when I saw my mum looking at me from a distance while I was bent over the toilet and throwing up her homecooked food. However, that wasn't enough for me to stop. During that time, I was obsessed with losing weight. I was a pathetic example of a human being and all I cared about was staying at between 54kg and 56kg. That gave me some twisted feeling of being at ease with myself. Q How did you overcome the problem? A It took at least two to three years for me to accept that eating was not a punishment for my appearance. It helped that I had a supportive partner. I started to train harder and gradually gained muscle strength. I felt even stronger after I started doing functional fitness exercises. And I started to slowly accept the person I saw in the mirror. I finally overcame the disorder in 2012 as I did not want to be a slave to it. Q What is your diet like now? A I eat whatever I feel like eating but only when I'm hungry. I know what is good for me and what is not. I realise my body can function with whatever I put in. For me, coffee is a must - I like it black with no sugar. I do eat at McDonald's, which has decent meals if you go for the healthier choices. A I have tons of medals. I don't really care about the events or the races that I have won. To me, the medals are just scrap metal. It is the experiences that I value. I do value my sports shoes, though. A Nope, I don't believe in that. A Most definitely not. I'm average- looking.